Marlin Built For Your Life! Download flyer about ICF Building HERE! The air tight ICF walls greatly reduce the amount of air infiltration into the home. This drastically reduces the amount of airborne dust and allergens. 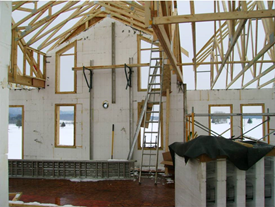 ICF construction eliminates the studs and cavities that can hold moisture and foster mold and mildew growth. These walls do not require an additional vapor barrier. Because of its air tight construction a recovery ventilator (HRV) system should always be incorporated into the design. ICF built homes are up to 8.5 times stronger than a wood frame home. The steel-reinforced concrete walls can withstand winds up to 200 miles per hour. ICF foundation walls resist buckling and cracking five times better than the concrete block wall. 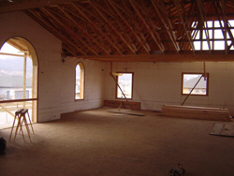 The ICF wall is superior to the traditionally built home for fire resistance and containment. The ICF wall has been proven to withstand fire for as long as four hours. The wood frame walls typically collapse in less than an hour. 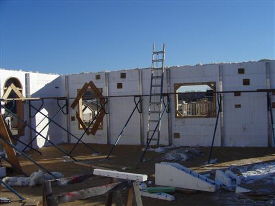 The foam used in the ICF blocks is manufactured with flame-retardant additives. As a result, the foam will just melt away but not add combustion. An ICF wall helps to contain a fire. The temperature needed to pass a fire from one side of the wall to the other usually does not exist in a house fire. Serious house fires can contain temperatures of 2000 degrees Fahrenheit. An ICF wall will not allow the fire to pass through it even at these temperatures. In a typical wood frame wall, the wood from the wall actually feeds a fire and facilitates the spread of the fire from one room to another. An ICF home also increases your home security. Often a burglar will enter a house through a wall-usually the wall between the garage and the home to avoid setting off glass break alarm. This would not happen with an ICF wall. ICF walls cost a little bit more to build than a typical wood frame house. If a wood frame house would try to approach the thermal insulation mass, air filtration level, structural strength, and quietness inside, the cost of the wood frame would greatly increase, making the ICF house an exceptional value. Since ICF houses are more energy efficient and air tight, the heating and cooling equipment and ductwork can be downsized resulting in lower cost also. Homeowner’s cost will be lowered significantly because of the cost savings that they will receive each month from their energy bills. ICF owners will also save money on their insurance rates because of the disaster resistant concrete walls. ICF homes also have reduced maintenance costs because of their resistance to the elements and termites. The ICF monthly cost savings should about equal the additional cost of financing. You would have a superior home for a price equivalent to the cost of a wood frame house. Savings will again be realized when you sell your home. There will be an increased resale value as the result of the above benefits. Ask about a Federal tax credit and energy rebates. ICF homes are usually much quieter than the conventional built home because of the several inches of concrete sandwiched between the foam insulation. Insulated concrete forms are rated among the quietest building products on the market. You’ll be amazed by how much noise you won’t hear in a concrete home. You can save up to 50% to 80% on your energy bills. These insulated concrete walls keep the hot and cold air out of your home. An ICF home is extremely air-tight. Energy savings from reduced air infiltration are obvious when you look at the large amount of heat and cooling losses experienced in traditionally built houses. You will also notice that the temperature remains constant no matter what part of the house you’re in. Your house will stay cool in the summer and warm in the winter with uniform temperature throughout the home. Homes built with ICF are designed to last for centuries. Concrete’s sheer durability over decades of use goes a long way toward waste reduction. ICF construction conserves forest resources and their energy efficiency reduces fossil fuel consumption. It’s estimated a 3,800 square foot home saves up to 25 large trees when compared to the conventionally built home. Concrete is inert, non-toxic, and is produced from abundant natural and recycled material. An ICF home also has a lower waste factor. In a traditional wood construction house 5% to 10% of materials end up as waste. ICF forms are recyclable. Because these forms can be cut to fit, the cut off portion can often be used elsewhere. An ICF wall system produces little waste to begin with. Total waste from ICF construction is thought to be 1 to 2 percent.